After the Worlds, it was hard to find Wang Liqin because of all his civic activities. On May 16, our reporter finally caught him practicing at the training halls of the Shanghai team. Wang wore a white T-shirt, blue shorts, blue name-brand shoes and white sock with blue trims. He looks casual, but one can see his attention to detail. "I am a perfectionist", he said. He also said that he is trying to "not obey the coach". The media has always paid attention to Wang, whether it was his "first-class techniques", or his "wavering mentality". His unexpected wins or losses are interesting subjects for the reporters. Now let us listen to Wang talk about himself. To prepare for the 9th National Games qualifying rounds, Wang rushed back to Shanghai to train. During a break, he told the reporter that he got sick the previous night, and had to receive shots at a hospital this afternoon. Tonight, he has to attend a send-off party for the women's team, and he is feeling a little weak. "Why not take a day off?" the reporter asked. "No time. Ever since the Olympics, I have not had time to rest", Wang replied. Many feel that Wang's techniques are the best, and yet his mental strength is the weakest. We asked Wang: "Do you think your mental abilities are your biggest problems?" Wang thought for a short while, and then said: "There was a time when I felt that way, and I paid attention to that theory. But later I felt that I understand myself the best, and how could others know exactly how I felt? If I paid too much attention (to that theory), I would start believing it is true even though it may not be true. After the start of the 45th Worlds, my problem was that I tried too hard to play well. That gave me a lot of pressure and excess baggage." The 45th Worlds will perhaps remain Wang's biggest heartbreak forever. Then the young star had high hopes of winning the Men's Singles title. But with the event barely underway, he lost to Damien Eloi. Wang said that he was depressed for a long time afterwards. That October, he could not make it into the final 8 at the World Cup held in China. Coach Cai told reporters that Wang was "brainless". The reporter asked Wang: "Was Cai's criticism a big blow to you?" Wang immediately replied, "Of course. That came from the head coach. But I also understood Cai's frustrations that I was under-performing; he really wanted me to play well. If it were someone else (instead of me), coach Cai would not have been so angry. He was often my coach on the court, and I felt that if I did not play well, I would have let him down." "You respect your coaches. Do you always do everything they tell you to do?" the reporter asked. "In the past, I mostly listened to my coaches, and have not thought about whether what they told me was right for me, or why. So I did not really understand. When I did not reach a goal, I kept training harder, instead of really communicating with the coaches", Wang said. "How about now?" the reporter asked. "I am trying to tell my coach how I feel", Wang said. He took off his drenched white T-shirt, and put on a black one. The reporter said, "You are very particular in the way you dress, and you attend to details". Wang smiled and said," I like to shop and buy clothes. I seek perfection". Wang looked at a banner in the hall: "Spirits, Courage, Intelligence, Ferocity". The reporter followed his eyes and asked, "What do you need the most?" "Ferocity. At the critical points, I lack ferocity", Wang said. "Is that due to your mild and introvert character?" the reporter asked. "Probably a little bit. I am trying to make slight changes in my character", Wang said. "Make more contact with people. Express myself more, and be an observer less." After the Worlds, the team transferred coach Shi Zhihao (ex-World Champion, husband of Cao Yanhua) from the women's team to become Wang's coach. Perhaps it is because they are both from Shanghai, the two get on very well together. Shi said that the Shanghaiese dialect is very popular in the national team, and that when Cai coached Wang, he talked in Shanghaiese. One of the memorable scenes in Osaka is Wang losing the first 2 games to Kong. According to impressions from Wang's past, many thought that Wang was finished. But Shi told Cai in the stands that the 3rd game would be a turning point for Wang. If he could bear down for a few points, he had a chance. "Actually", Shi said deliberately, "this match was pretty much what I had expected. The previous night I told Wang that Kong is the grand-slam winner, and has ability. Kong's level is now back to what it was before, and he has better mental ability than you. His tactics and strategies are rich in variety, and he plays with ferocity. You, Wang Liqin, are afraid of that. In this match, Kong will fight hard in the beginning, and you may not be able to stay with him. But don't worry. In the match, you are not the only one who is having thoughts. When Kong is close to winning, he will be having thoughts. For example, he may want to play safe, and win the points a little quicker. At this time, you must bear down. If you can withstand the pressure, Kong will get a little scared. Because during our practice sessions, Kong rarely beats you." This Worlds team event was a difficult "passage" for Wang. In the quarter-final match, Wang lost 0-2 to Timo Boll of Germany. In the next match, his number-2 position was taken away. The coaches will not play him in even the 3rd spot, and use Kong, Liu and Ma instead. Wang did not play in the finals either. To be able to win the MS title under these conditions, and to come back from 0-2, was very precious for Wang. Shi said, "In this Worlds, the most important thing about Wang is that after his difficulties in the teams, he was still able to win. This shows that he has matured. For the first time, one poor performance did not leave any devastating effects". He told reporters that the national team has made the biggest investment on Wang, and has provided many opportunities for Wang. The national team has many top players. Cai has worked hard to help Wang succeed, and had a lot of pressure. Many were asking: why do we have to play Wang? During the last 5 years, Wang has established his technical superiority. But why was Wang not able to play at his level all the time? Shi does not think that it was because of Wang's mental qualities. He told Wang: "On one hand, you still have not fully grasped certain techniques. On the other hand, there is the question of guts". Shi hopes that Wang can make slight changes. He said, "My principle is that as a person one has to be honest, but as a player, one needs to be 'deadly'*. Wang needs to work on being more 'deadly'. I don't like it when I say something, and my player always agrees with me. A player should have his own way of thinking, and it is best if he can argue with me and prove me wrong. Wang listens too well, and lacks a dominating attitude, a ferocity, and a mindset of 'I do what I want to do'. He does not like to express himself, but instead wants to prove things with facts". Shi feels that if the coach teaches too much, there is no room for the player to express himself. He prefers to give Wang guidance and let Wang develop his own training methods. Wang's biggest inadequacy is his inability to extricate himself on the court when conditions were tough. The coach might have said A, B, and C. But on the court, if C, B and A happens, Wang does not know what to do. Shi said, "For example, if Wang has planned carefully what to do if his opponent attacks his left, and now his opponent attacks his right, he feels awkward. One weak link can mess up the whole game. We have to develop his confidence, and his ability to adapt on the court". "I plan to teach him golf. That is a suitable sport for him. He can do whatever he wants to do. He is too rigid, and I want to broaden his horizon", Shi said. 21-year-old Liu Guozheng once again played an heroic role at the Worlds. 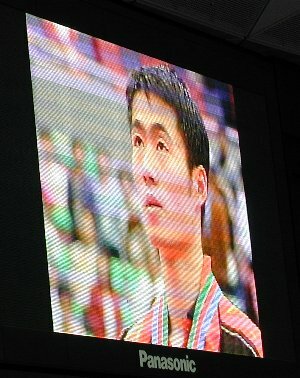 In the semifinal team match against Korea, Liu, with his nerves of steel, saved the Chinese team from disaster. He also scored a vital point in the final match against Belgium to help China regain the Swaythling Cup. Last week we had an exclusive interview with him. Reporter: "In the match against Kim Taek Soo, you were pushed to the edge 7 times, but you survived. Li Furong said that that was the most exciting contest he has seen in 40 years. Can you tell us your feelings during the match and afterwards?" Liu Guozheng: "To tell you the truth, I was very nervous, because if I were to lose one more point, we would have been eliminated. That would be a disaster for the Chinese team. Fortunately, I was able to calm myself down, and put all my energy on fighting the opponent. I finally won. Afterwards, I have thought about that match, but every time I was afraid to think further. That was too scary a journey. 'A contest of hearts' probably describes well how I feel about that match." R: "Waldner thinks highly of himself, and yet he gives you high compliments. He said that you will be world-number-one within the next 5 years. What do you think about that?" L: "Waldner is the player I admire the most. I have to thank him for his praises. The truth is that to be number one has always been my goal. I hope to reach that level, and contribute to our team's success." R: "You have played in two Worlds and one Olympics. It appears that you have better results in teams than in singles." L: "This show that I am still not good enough. To win the MS title, one needs to go through 5 or 6 opponents, and one cannot lose a single match. One faces different playing styles, so without superior techniques, it is hard to be the last one standing. In the Worlds two years ago, I lost to Primorac 2-3 in the sixteenths. In last year's Olympics, I lost to Persson in the quarters. 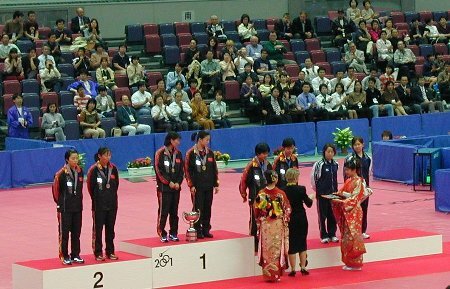 I also lost to Ma Lin in the quarters in Osaka. Although luck played a role in all those losses, the key thing is that my level is not high enough." R: "Many say that the Liu Gouliang-Kong Linghui era is over now. Now you, Ma Lin and Wang Liqin have taken over. Do you agree?" L: "I do not agree. Although Liu Guoliang and Kong Linghui did not have great results this time compared to the past, that was largely because of the bigger ball. I think that with their experience, they will fully adjust and return to their previous levels." R: " Tell us your biggest rewards and your biggest disappointment in Osaka." L: "The biggest reward is that I have made progress in my mental quality and spirits. The biggest disappointment is of course my mediocre results in singles." R: "I guess winning a world single title must be your biggest goal from now on." L: "You guess right. I will fight hard in the 2003 Worlds and in the 2004 Olympics. I have to do this to deserve Waldner's compliments, don't you think?" 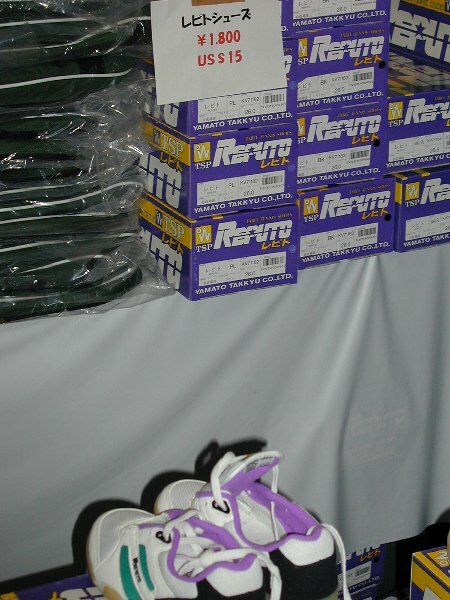 There were some good deals at the Worlds, and this one was the best, if you fit the Japanese size 30 shoes. 1000 yen is about $8.30. No tax, too. 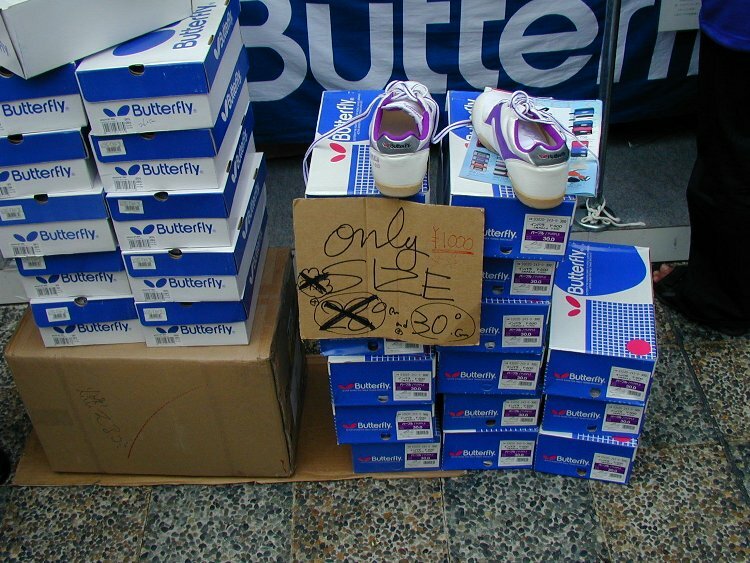 Here is another good deal on shoes. This is not one of the better deals. 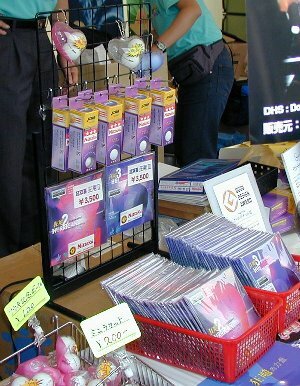 The DHS Hurricane-2 and Hurricane-3 sell for about $11 in China, or about $17 in Hong Kong. In Japan, with the Nittaku seal, they go for $29. 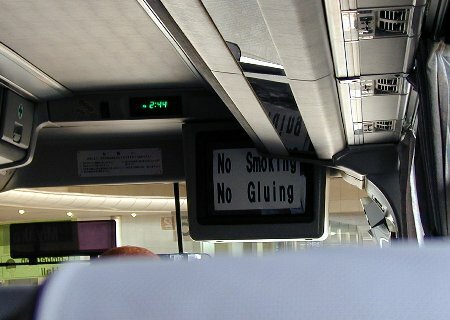 Here is an interesting sign on the TV monitor in the shuttle buses. No Smoking, No Gluing, ....No TV!. Wang Liqin watching the Chinese flag. This appears in the Stiga ad in the May issue of "Table Tennis World". Ma Lin wears Stiga 203, and Wang Liqin wears Stiga 202. 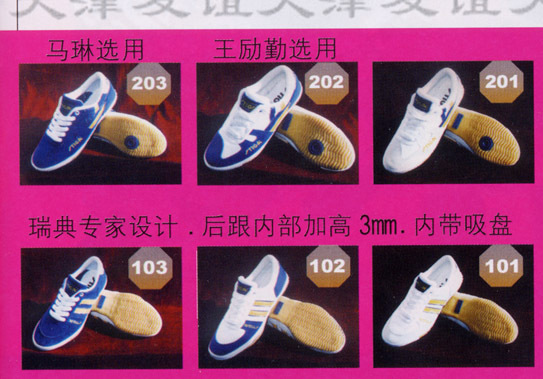 These shoes are probably for sale in China only. From the CTTA site. Click on the numbers below to go to the other pages. 11 pages total. The qualifying rounds for the 9th National Games were played this week in Chengdu, Sichuan. World-ranked players like Kong, Wang, etc., are already qualified for the singles events, although they are all here for the doubles. If one needs any proof that the Chinese table-tennis talent is deep, one needs to look no further than the singles qualifying round results. Out of 128 men's and 128 women's entries for the singles events, the first seed in each event did not make it to the final 16 (who qualify for the final rounds). Zhang Yong was the number-one seed in MS. Li Nan, Osaka quarter-finalist and Eindhoven semi-finalist, was the women's number-one seed. Other players who failed to qualify include Guo Yan (2001 Croatian Open winner), Shan Mingjue, Xie Minjie, etc. The finals will be played in October.